to wake up your senses, be in the present moment and enrich your perceptual world. It’s a great entree into art-making or writing. A delightful creativity warm-up activity. And a small, easily digestible pill of soul nourishment. Fungi and Lichens on Rock. Love these. What’s really truly ultra important here? An essential part of mindfulness. Don’t beat up on yourself if you drift off from the present moment. See if you can bring kindness and compassion to the you who is humanly, naturally, busy or jumpy or wafty or wandery in the mind. Minds like to think. That’s their specialty. Buddhists talk of two wings – a wing of wisdom and a wing of compassion. See if you can bring awareness to what’s there around you on your walk. See if you can bring kindness to yourself as you ‘succeed’ or ‘fail’ at this task. Then see if you feel a little more inspired to CREATE. Tree Textures and Shapes. What is this tree? I’m not sure. Very Australian. 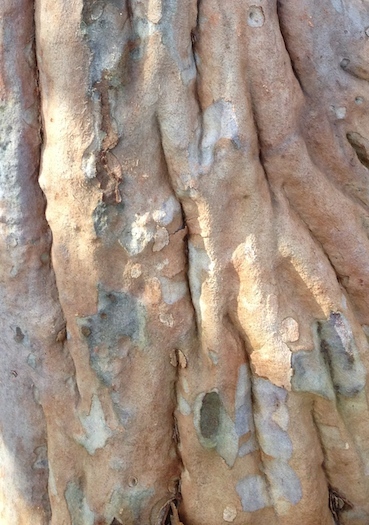 Angophora? 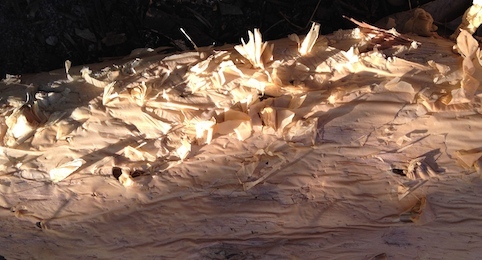 Let me know if you give the Mindful, Kindful Texture Walk a burl. That is, give it a go. (to use an Australian expression and continue with the local landscape theme). This entry was posted in creativity tips, kindfulness, Seeds and Snippets and tagged access creativity, creativity tips, inspiration, textures, walking meditation by Art and Soul Space. Bookmark the permalink. Even in this very interior, functional environment where I am writing this, I’m suddenly aware of textures at lots of levels–thanks, Sally! Excellent to hear, Clare! Wondering what sorts of textures. Desk? Carpet? Keyboard smoothness? Super Sally, you’ve nailed it. I especially love the idea of texture appreciation as it calls for all of the senses of vision and touch and smell to be engaged. And there is something about the act of consciously appreciating nature which brings us to a mindful state of awareness – the most fertile groupd for creativity…..
Vivacious Val – you in turn have nailed it – a mindful state of awareness as a fertile ground for creativity. I will NEED to do this! 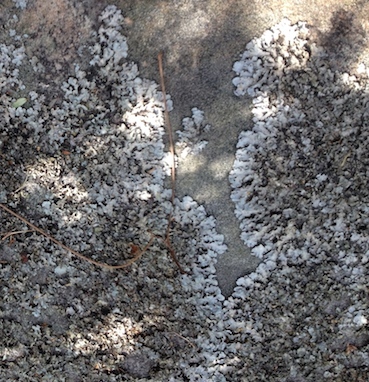 Texture walk.. sounds fun to do with kiddos, too! Yes, Joy, good idea to do with kids too. Brilliant idea. I get lost in these images and appreciate them when I see them on my walks too. Nature has its own kind of natural art that stops me in my tracks some days.